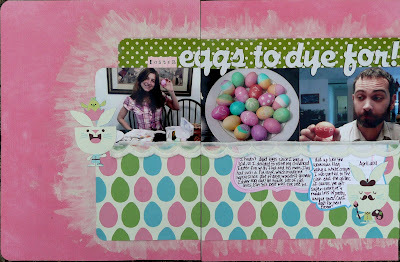 I don't know why, but deep down inside, there is a part of me that feels weird for scrapbooking the kids I nanny. I guess I'm okay with it, but I feel like others think it's strange, and I feel like they are judging me. 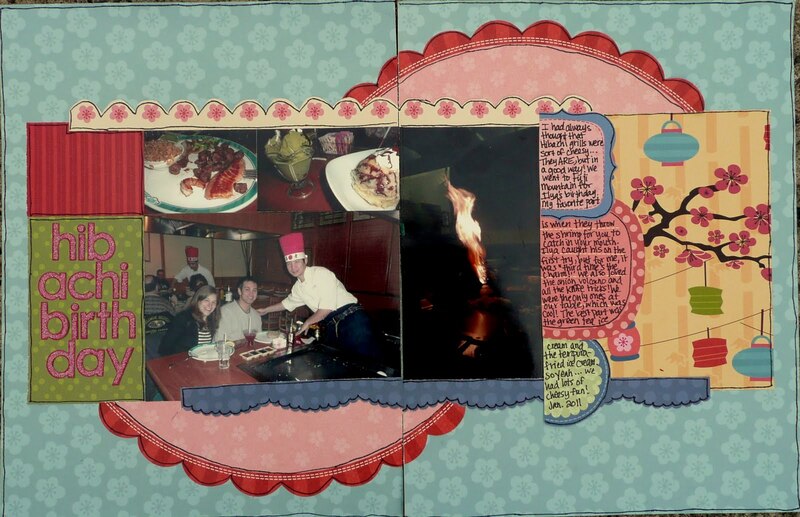 Other scrapbookers always ask me, "Do you give those pages to their parents?" and I'm like, "No...They're for me..." I need to get over this negative feeling, because the truth is, I spend 35 hours a week with Caroline and about 10 with M.J. They are a large part of my life, and I love them both so much. In fact, I should be proud of the fact that I love these kids and my job so much that I want to remember them. So without further ado, here's a page about Caroline, who I have taken to calling "Gidget" in recent weeks. It suits her. 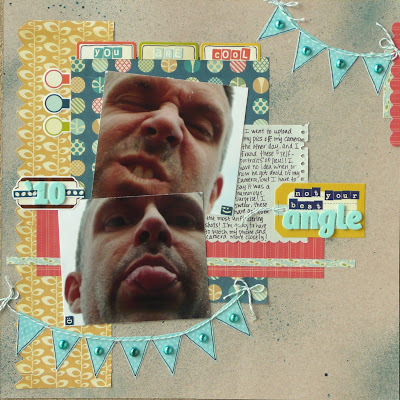 I combined sketches at Creative Scrappers (155) and The Scrappiest (119). It's also for the challenge at Crop Addict to include memorabilia. I added one of Caroline's little hair clips to the corner of one of my photos. I buy her about a pack of these every 2 weeks because unless you sneak attack her when you put them in, she will pull them out. Last, this is for the open challenge at Sketches in Thyme. This ones about M.J. and his crystal meth-like energy level. 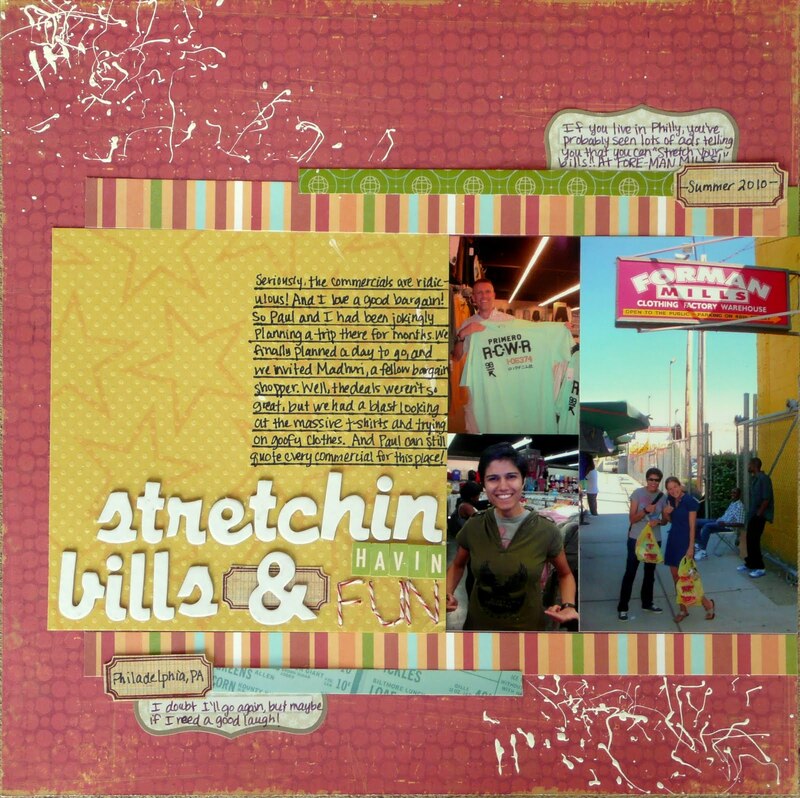 I combined 2 sketches for this one (Punky Scraps Sketch 119, and Creative Scrappers Sketch 154). 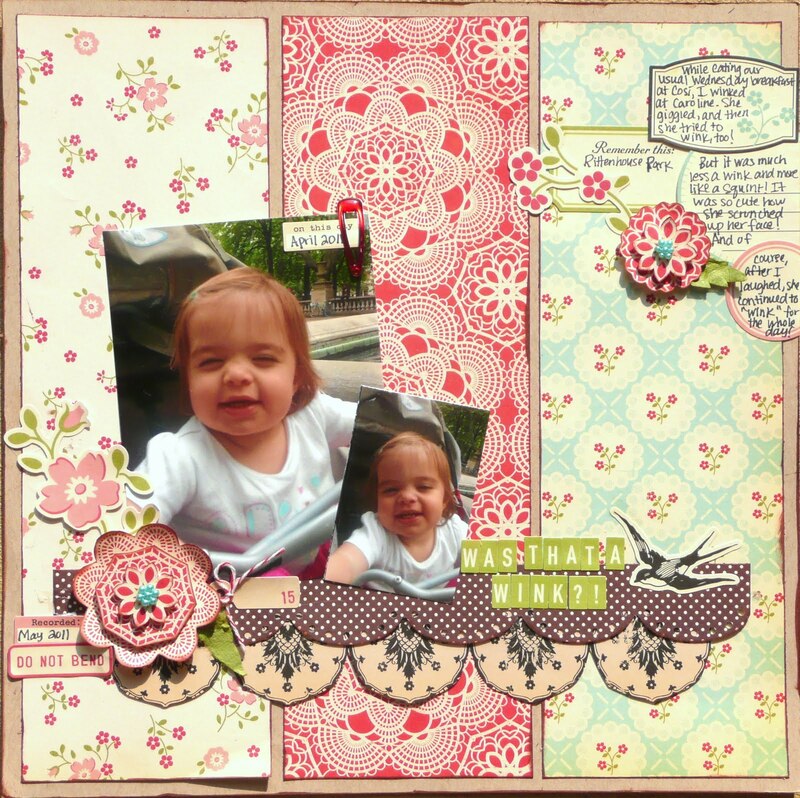 This was inspired by Wendi's favorite layout for the scraplift challenge at Design Dollies. 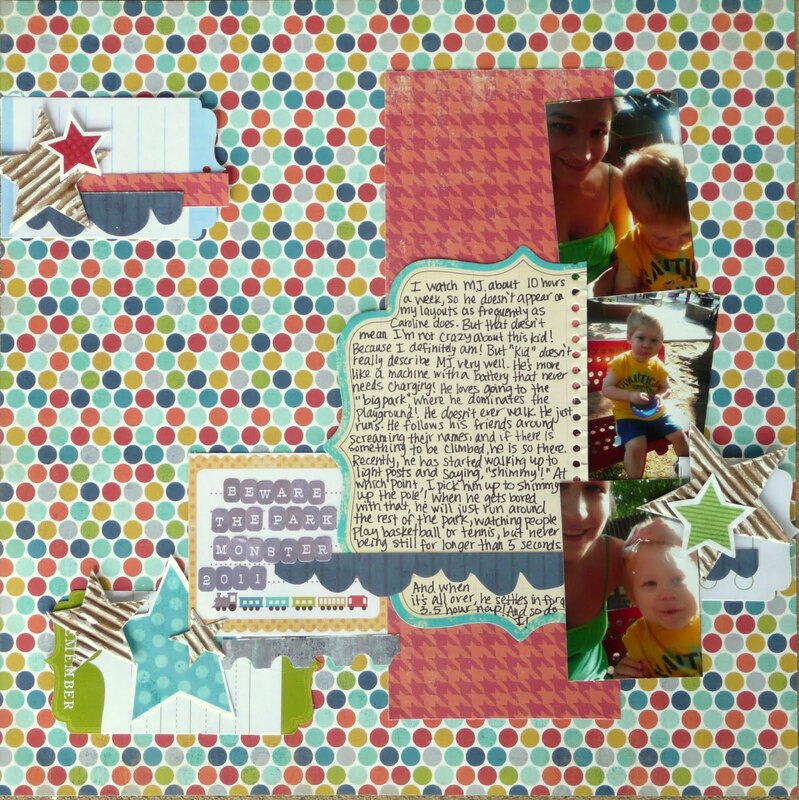 I lifted the striped stars, scallops, fun mix of patterns, and overall page layout. This is also for the challenge to "show us the boys" at Paper Issues. This first layout is about a trip I took to FOR-MAN MILLS with my friends. If you've never been to a FOR-MAN MILLS, I suggest you don't worry over that fact. But do click on this link so you can hear the funny song. FOR-MAN MILLS! 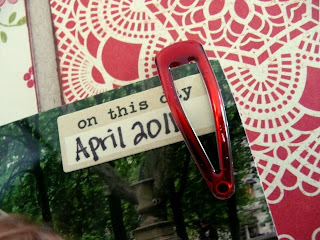 Anyway, this is for the May 123 challenge to use fire engine red, a stitched title, and the word "fun." 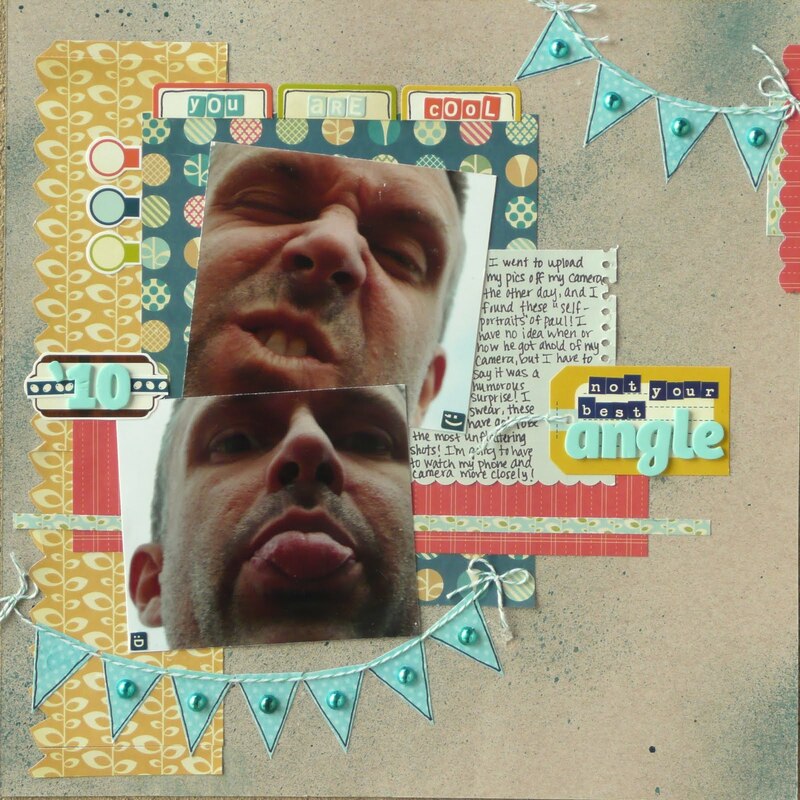 It's also for the challenge at Scrapbookers Annoymous to create a patterend paper and 3 embellishments with stamps. 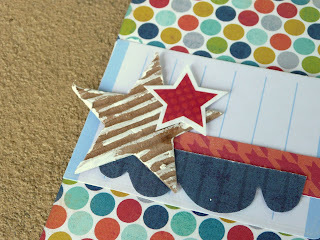 I stamped my yellow Bo Bunny paper with a Studio Calico Stamp and my three brown labels were made with a Stampin' Up! stamp. I also used yellow, pop dotted alphas, and paint splatters for Mission 41 at Mission to Create. 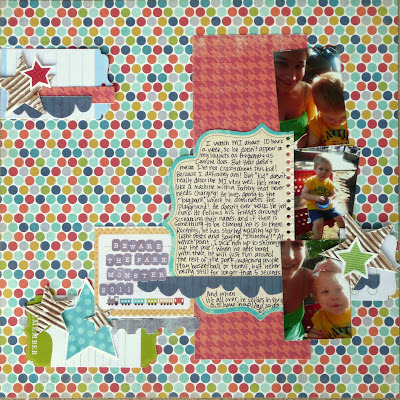 I used sketch 118 from The Scrappiest. Last, this is for the challenge at Punky Scraps to use twine, a stamp, stitching, paint, and no cardstock. I doodled the hell out of this one, and I really love how it turned out! I doodled borders, my title, and around the circle accents. This is for the challenge to scrap an important female in your life and include at least 20 words of journaling at Scrap the Girls. Ha! That was an easy one for me! My color combo was inspired by the picture at Lollipop Ladies. 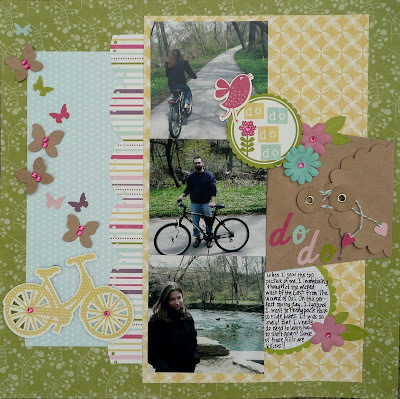 My "5 things I love abot you" theme was inspired by the challenge at My Scraps and More. I did this for two other challenges, but I didn't finish on time. MOTHER FRITTER! Heh heh... I love these pictures of my friend, Paul. I discovered these while uploading pictures from my camera. This is for the ACOT-sponsored contest at Page Maps. It's also for the challenge at These are a Few of My Favorite Things to scrapbook some favorite photos and the challenge at ScrapFit to scrap a guy in your life. It's also for the Sweet Peach Blog Shoppe "SPRING" challenge. I used scallops, patterned paper, red, ink, numbers, and green. Last, this is for the Cosmo Cricket blog challenge to use mini deck papers. 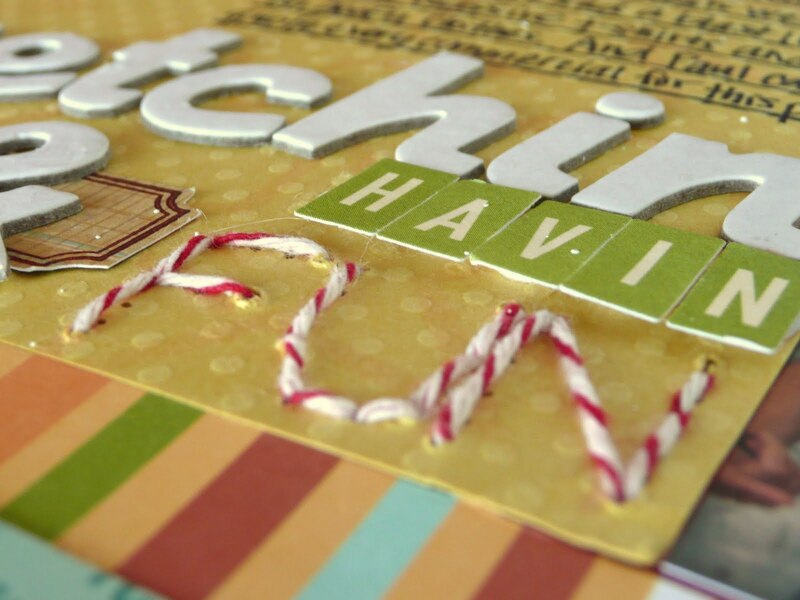 Besides the kraft cardstock, all of the papers that I used are from the Social Club mini deck. In fact, to make the longer strips of paper, I adhered two mini deck sheets together. 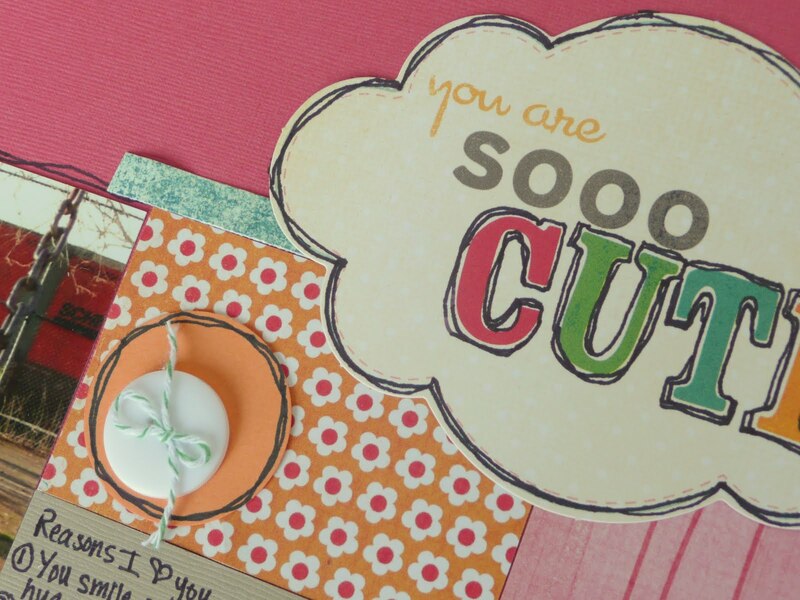 I also used Cosmo cardstock stickers and mini letter stickers. 10. The fire alarm in your building goes off at 3am, and instead of thinking, "OH CRAP! I have to save my scrapbooks and koalas!" you think, "OH CRAP! If the fire department sees my apartment, it will be labeled a fire hazzard and condemned!" 9. You no longer refer to your apartment as "your apartment." You now call it, "the apartment I share with some roaches and a couple of mice." 8. You sleep on 1/3 of your bed because the other 2/3 is covered in scrapbooking supplies. And it's not really a bed anymore. It's more of a crumb buffet. 7. You get up in the middle of the night to go to the bathroom, and you slip on pizza box and land with your arm in an empty picture frame, your foot in a gift bag full of green tissue paper from Christmas, and your head on one of those Entertainment coupon books that you've been looking for for a year. You curse your luck because you wish your head landed on the gift bag full of tissue paper because it's softer than the coupon book. 6. You fear that if you brought the children you nanny over to your place, they would be lost and floundering in the junk. You consider taking them to the ball pit at Chuck E. Cheese's for training but decide the balls wouldn't be deep enough. 5. Not only can you not find your TV remote, you can't find your TV. 4. A TV crew from Hoarders comes by, and they ran away after you open your door. 3. Scientists from America's top universities are vying for access to your kitchen sink to study the new species that has evolved from the crud in the drain. Researchers hypothesize that if current rate of evolution that they have observed continutes, the creatures in said sink will be able to talk in 3 weeks. 2. There are enough empty diet coke cans lining your window sill that at a rate of about 2 cents a can, a homeless man could cash them in and eat 3 square meals a day for a month. 1. Your apartment smells like tires. 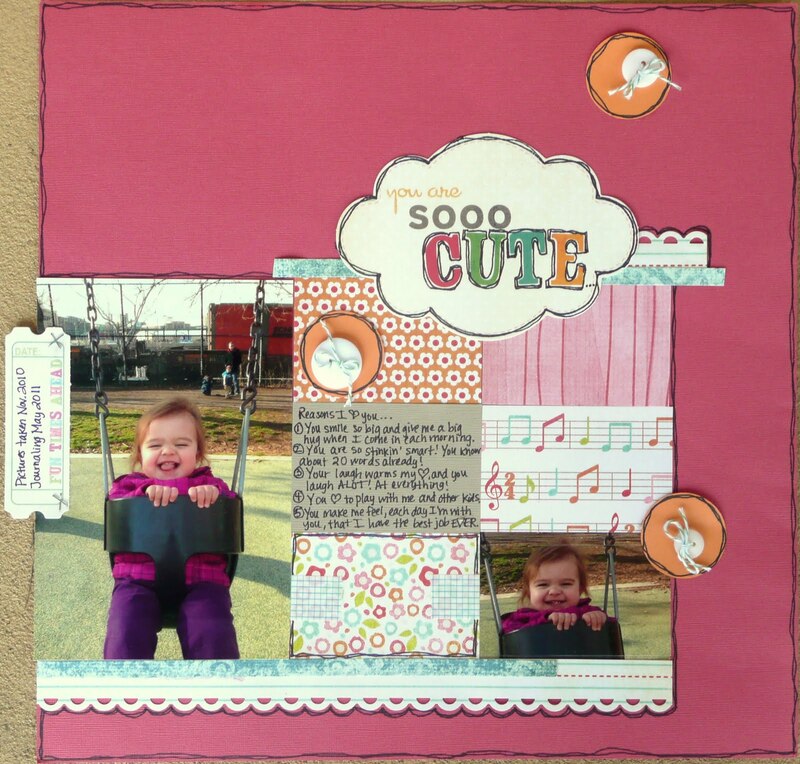 This first layout is for the Friday Fun Day challenge at Lucky Girl Crafts. I was inspired by Natalie's note holder. 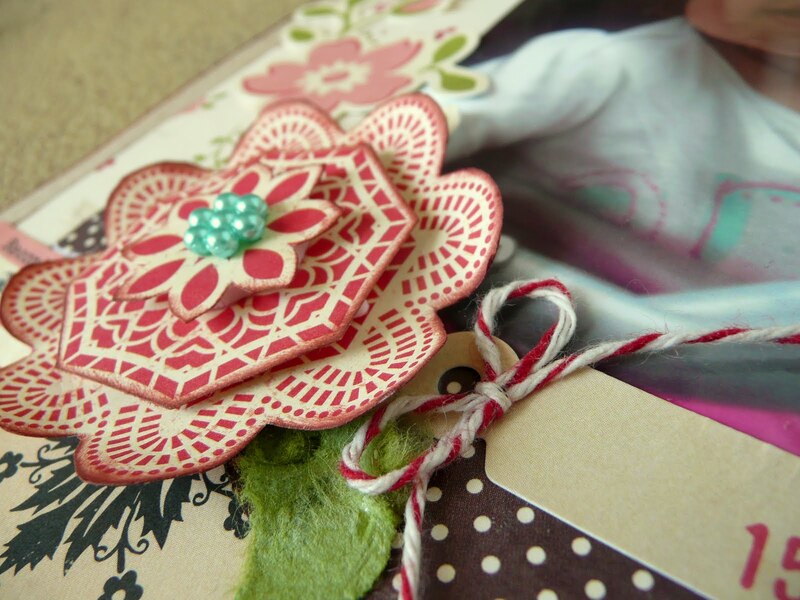 Basically, her cute project inspired me to use a scalloped kraft envelope on my page, which I think looks alot like her note holder. I like how she embellished the actual closure of her enevelope, so I replaced the white string that came with the envelope with green twine and added little heart stickers at the ends to mimic to her stars. This one is also for the Friday Fun Day challenge at Lucky Girl Crafts. This time, I was inspired by Jessica's use of paint on her page background. I actually think her painting is much better than mine, but oh well... This is also for the polka dot challenge at The Paper Variety and the challenge to scrap your favorite thing about spring at These Are a Few of My Favorite Things. I fussy cut those cute little rabbits from some K & Company paper. So vintagey cute! This last page is for the Mission to Create challenge. I used primary colors, journaling blocks, and the "What a Beautiful Mess" picture inspired the way I lined up the letters in my title. This is also for March's Project 12.